If you’re a fan of Animal Crossing, I’m just going to tell you to go do what you’ve already done. Just pre-order Animal Crossing: New Leaf, stock up on eShop cards, or keep that $35 tucked away for June 9th. There’s nothing about New Leaf that’s going to turn off old fans from enjoying it. In fact, it’s easily becoming my favorite in the series. Granted there’s a lot more time to spend with the game than the couple weeks I’ve had to make that statement final, but I think most will agree the changes made in New Leaf make for a more enjoyable experience. If you’ve never played Animal Crossing before, you’re in for a treat. While the general concept of the game doesn’t sound incredibly exciting on paper, you’ll be amazed at how remarkably absorbing New Leaf ends up being. Having an elevated level of control over the town you create, even more so than previous entries in the series, means you’ll spend hours upon hours with this title throughout the year. If a title like Fire Emblem: Awakening has been topping your internal most played chart on the 3DS, Animal Crossing: New Leaf will absolutely thrash those numbers. And chances are you’ll enjoy every moment. From the point your avatar steps off the train into your newly named town, you’ll notice a number of differences from previous Animal Crossing entries. Gone is the standard tutorial, and while you’ll still need to earn bells to pay off your initial house building (and subsequent expansions), there’s not a great deal of hand-holding on Day 1. Your starting animal residents will greet you as Mayor as soon as you reach the train station, and from there you’ll pick a spot to lay a tent, serving as an initial abode until your house can be built. As Mayor, certainly the biggest addition found in New Leaf, you’ll be charged with creating public works, maintaining town happiness, and creating ordinances for your town to follow. When you first step into the Mayor’s Office, you’ll meet Isabelle, your go-to girl for finding out how well the town is currently doing, reporting animals you’d rather see deported, and the person that’ll issue your projects and edicts once you’ve ponied up the appropriate bell cost. She also serves as a way of moving through a series of tutorials for newcomers to the series, introducing standard concepts like fishing, bug catching, writing letters, and gardening. If you’ve never played Animal Crossing before, I’d urge you to seek her out in order to get a quick grasp on what to do. A lot of the day to day activities are the same here as they were in previous Animal Crossing titles. You’ll chop down trees, plant flowers, dig up fossils, fish, catch bugs, and interact with your animal neighbors. Cross-breeding flowers is still a thing, but certain actions have also been simplified. Planting new trees, for instance, requires virtually no maintenance now. As long as you plant far enough away from other objects or obstacles, you’ll rarely see a sapling die. In previous Animal Crossing titles, I almost always flubbed planting coconut trees, but in New Leaf I’ve had little trouble creating orchards for any fruit or plant I’ve found so far. Also, grass degradation isn’t nearly as fast and frequent as it was in Animal Crossing: City Folk. Even flowers tend to wilt slowly, and while it’s a good idea to water frequently if you’re looking to cross-pollenate for rare breeds, you don’t need to waste much time on keeping things pretty. And if you’d rather not mess with it at all, there’s an ordinance that will keep your town free of items like weeds, giving you time to do what you’d prefer. Ordinances in general are a great addition. I’ve enacted the night owl one myself, which pushes everything to a later hour. Both shops and animals will stick around until late in the evening, perfect for my current schedule. You can also shift that to something structured around early risers, or issue an ordinance that simply improves cash flow when selling. There’s not a huge list of ordinances, but the ones given are certainly useful depending on your current goals. And while there is a bell cost associated with each one issued, it’s pretty negligible once you get access to the new island. The Island, something found in the original Animal Crossing, also returns. You can visit the island by yourself once it becomes available early on, and while there you can participate in a number of mini-game events. These events usually involve things like fishing, gardening, digging up fossils, matching items, and Memory-style digging games. There are three difficulty tiers for events that open up slowly over time, and successfully completing each event will net you Medals. These Medals are used as currency on the island for a small set of items that can only be purchased while there. For the most part the mini-games available are fun, but there are certainly a couple that felt tedious to me. And playing these alone takes a lot of the fun out of the experience, enough that I’d highly suggest participating in groups only. And while Friend Codes are still required if you’d like to visit the towns of other players, there is some allowance on the island for random matchmaking across continents. This matchmaking mechanic is easy enough to initiate, allows for four players at once, and feels virtually lag free when connected. The Island also provides a lot of Bell-making potential. On the Island, summer is in constant effect. The exterior portion of the Island is quite small, but surrounded by water on all sides. While there you can fish and catch bugs, and also go deep-sea diving, something new for the series with New Leaf. Rare bugs and fish are literally in abundance on the island, spawn quickly, and end up being one of the most efficient ways of making bells. And considering that there’s a lot of stuff in the game to spend bells on, it’s nice to have the funds available. Re-Tail, one of the new shops in New Leaf. Other improvements stem from the main street hub located across the train tracks, which houses most of the shops you’ll visit on a daily basis. At the beginning it’s comprised of only a handful of locations, like the Museum, Nookling Junction, Nook’s Homes, the post office, and the clothing store. But as you complete tasks or past certain thresholds, you’ll unlock new shops and upgrades to check out. Some upgrades, like Nookling Junction (think Nook’s Cranny), are carryovers from other titles. But a lot of the shops available here are new to the series like the shoe store where you can outfit yourself with new shoes, boots, and socks. Also worth noting is that the pro-design creations are still an option for clothing, and created designs can also be carried over to decorate furniture and the town itself. 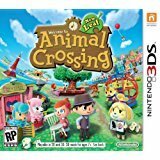 Animal Crossing: New Leaf really sports of lot of additions and changes to the standard formula the series is known for, but without making it an unrecognizable experience for existing fans. It certainly remains a “create your own fun” type of experience, but with a vastly expanded number of options at your disposal. In previous entries I might have spent an hour or two a day with Animal Crossing, but in New Leaf it wasn’t uncommon for me to lose 4 or 5 hours a day, and still have stuff left to do. The expanded item catalogue, the addition of Dream Suite allowing for vandal-free online connections with random towns, and the new Island activities really add a lot to the series. And while Animal Crossing: Wild World felt like a scaled down experience compared to something like City Folk on the Wii, New Leaf is far more robust than either and really pushes Animal Crossing to new heights. There are some relatively minor issues present, but the one that stands out the most is the grammatical errors. While Nintendo’s localization efforts are generally top notch, I noticed a surprising number of dialogue issues during my time with the game. It’s certainly not a huge deal, but stands out more considering the game is so text heavy. Also, I wish online play wasn’t as restrictive and dependent on friend codes. If I want to run the risk of playing online with strangers, just let me do it. But the positives vastly outweigh the negatives here. There’s so much to do and enjoy in New Leaf that you’ll spend a long time with the game without it ever outstaying its welcome. And the familiar elements retooled are for the better, breathing new life into mechanics that returning fans will know and love. Things specific to 3DS, like the actual 3D effect, are well-used here, with nearly no ghosting while on full blast. And the visuals in general are handled well, allowing for great detail, right down to the fur on animals encountered. Also worth noting is the excellent soundtrack, featuring a host of new melodies and tunes that stand out as excellent additions. Some familiar themes also return, but by and large this is one of best soundtracks for Animal Crossing so far. Some of the night themes across the town and island are absolutely fantastic. In closing, I absolutely love Animal Crossing: New Leaf. And I’m pretty confident you will too. There’s charm oozing out of every single corner (across both screens! ), and even if you’re not a long-time fan there’s a good chance this will be the entry that draws you in. I can easily say that I’ll be playing New Leaf for quite some time, and look forward to visiting more towns and meeting new friends once the game launches on June 9th.